NEW YORK CITY — Joe Bello, founder of NY MetroVets, said he had no idea Mayor Bill de Blasio was hosting a veterans roundtable until the very last minute. "I was not invited and did not know about the event," said Bello, a Gulf War veteran who has advocated for other veterans for 20 years. "I just feel like there is a disconnect. There is no one in City Hall who can speak for veterans." The City Hall roundtable, which was closed to the media, featured senior military officers, Mayor's Office of Veteran's Affairs Commissioner Loree Sutton and the Veteran's Advisory Board. 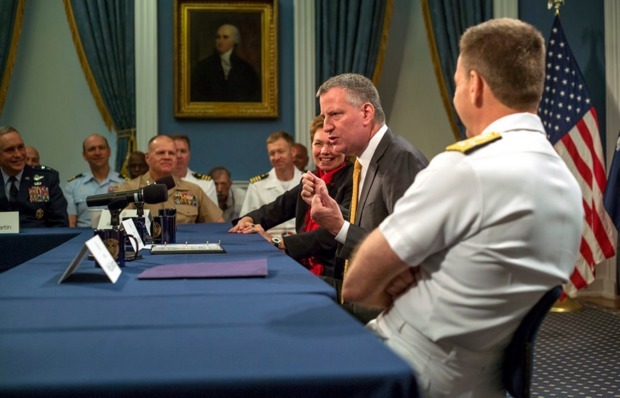 The event, held in honor of Fleet Week, focused on mental health and employment and was the first time in 12 years that the heads of the fleet commands have been invited to City Hall. "It was a very positive meeting, a very effective meeting," said the mayor. But some veterans groups called the meeting a "photo op." After almost a year and a half in office, the mayor has not taken the time to meet with some of the city's largest groups who interact regularly with approximately 230,000 military veterans from around the five boroughs, they say. "All we are saying is we have legitimate issues and things we'd like addressed," said Bello. "We can agree to disagree but at least we can say we addressed those things with the mayor and he knows about them." Kristen Rouse, executive director of the NYC Veterans Alliance, said veteran groups "remain very, very discouraged" about de Blasio's "continued tone-deafness" toward veterans. She said Thursday's closed-door roundtable was just the latest example. "I'm glad he met with active military leaders but it seemed staged," Rouse said. "Is the mayor interested in input from people who have been critical? Clearly not." The disagreement over the de Blasio administration's treatment of veterans has been bubbling for months. Veteran's groups protested on the steps of City Hall in April saying that de Blasio had yet to meet with them. Iraq and Afghanistan Veterans of America, a group that represents more than the 2.8 million veterans of the post-9/11 military involvement in Iraq and Afghanistan, wrote on its Facebook page this week that de Blasio's "veterans summit should have been open to many others." Critics say they don't believe MOVA's $600,000 budget is enough to help make any significant changes. They add that the mayor took nine months to appoint Sutton to head the office, and has not supported a bill by Queens Councilman Eric Ulrich to make MOVA its own city department. Thursday's roundtable came on the heels of a Daily News report that the city failed to fly the POW-MIA flag to honor missing and captured soldiers at City Hall for more than a year, angering vets. De Blasio called the flag oversight a "stupid mistake" that "sure won’t happen again." De Blasio spokeswoman Monica Klein said the mayor has made "supporting New York City's veterans and their families a priority." De Blasio has long cited the issues facing veterans as hitting close to home for him. The mayor's father was a war veteran had half of his leg blown off while fighting in World War II. At the opening of Thursday's roundtable, de Blasio said that his father was severely affected by his participation in the bloody Battle of Okinawa. "He didn’t – smart as he was, he didn’t know how to get some of the help I hope we can help people to get today," said the mayor. De Blasio also pledged to end homelessness among the city's veteran population by the end of 2015 in his State of the City speech earlier this year. The number of veterans who are homeless or living in shelters dropped to 990 from 1,645 in 2014, city officials said. And the mayor announced Thursday that he supported state legislation that would allow veterans of the conflicts in Afghanistan to add their war service time to help calculate their pensions. But veterans groups said de Blasio is taking credit for many veterans developments that he either had nothing to do with or actively tried to undermine. For example, de Blasio encouraged Gov. Andrew Cuomo to veto an earlier version of the pension legislation because it would be too expensive to the city, they say. And the pledge to end homelessness is a federally funded initiative from the Obama administration, Rouse said. "To announce this as your service to veterans is disingenuous," Rouse said, adding that she's still glad the mayor is moving in the right direction. The veterans groups say de Blasio can improve life for veterans by increasing funding for MOVA and supporting legislation to make it into a city department which would give it more power. While veterans issues are a part of the city's campaign to highlight mental health issues and expand treatment being led by First Lady Chirlane McCray, the mental health initiative should have a distinct veterans mental health and suicide prevention effort, the groups say. Bello said some of the issues are simple fixes that would go a long way toward improving the mayor's relationship with veterans. "When he was running for office he spoke about his father and we felt like he understands the struggle and wants to help," said Bello. "That hasn't necessarily been the case."